Just before the 2014 Lok Sabha elections Muzaffarnagar erupted in violence in which nearly 80 Muslims died, and thousands fled their villages. Now with the 2017 Assembly elections due in Uttar Pradesh, the BJP seems to have activated its machinery yet again. 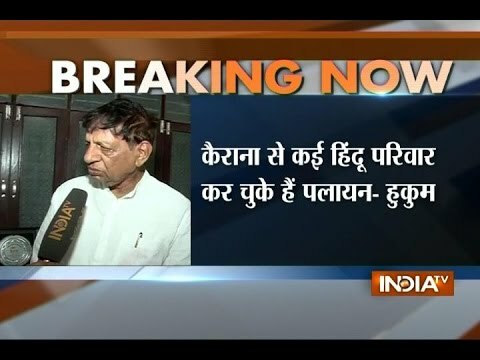 BJP MP Hukum Singh from Kairana claimed that hundreds of Hindu families are being forced to leave Kairana, a Muslim majority area in UP. The campaign revved up with BJP President Amit Shah personally referring to the alleged exodus from Kairana at the party national executive meeting in Allahabad. Prime Minister Narendra Modi also spoke, but as has become the practice, focused on development leaving Shah to raise the communal temperatures. Shah attacked the Samajwadi party government in the state urging the audience to throw out the government that had not stopped this “exodus” from Kairana. BJP leaders at the meet described Kairana as a “”Kashmir in the making” referring to the “exodus” of Kashmiri pandits. Hukum Singh had released a list of 346 persons last week claiming that Hindu families were leaving Kairana. 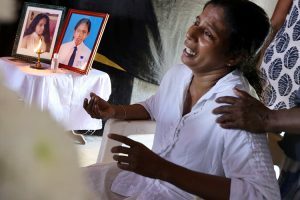 A complaint was also filed with the National Human Rights Commission that immediately sent a notice to the state government. So what are we witnessing? In a novel way BJP is manufacturing a divisive issue of exodus-migration from a Muslim majority area in the UP mainland, and seeking to further inflame it with a comparison to the mass migration of Kashmiri pandits to stoke passions across the country. More so as supposedly responsible leaders of the ruling party have made public statements supporting a claim from which—in the face of media reports—it is backing off now with Singh’s statement serving as a tame disclaimer. On the contrary Muslim ghettos have been deliberately created in cities like Mumbai and Ahmedabad. After the 1992-93 violence in Mumbai, the process of ghettoisation was accelerated particularly in Mumbra, Bhendi Bazar, Jogeshwari. Builders stopped selling/renting flats to Muslims in cosmopolitan Mumbai. In Ahmedabad similar and deeper discrimination resulted in the creation of ghettos like Juhapura. Derogatorily these localities are referred to as ‘mini Pakistan’ by communal elements, with civic and other services abysmal. In Karana’s neighborhood, Muzaffarnagar, large scale migration of Muslims took place due to the violence, which took place around the issue of love jihad, and through the circulation of a video clip by a BJP legislator showing two young men being beaten by a mob appearing to be Muslims. This video clip was found to be from Pakistan. Muslim looking mob. This video clip was from an event in Pakistan. This was followed by the maha-panchayats in which Bahu-Beti Bachao (Save daughters, daughter-in-laws) was the main plank. The result was the horrific violence which has led to Muslim households being destroyed. Many a villages have been converted to ‘Muslim free areas’. In UP itself the issue of beef again has been used leading to the lynching of Mohammad Akhlaq. This issue is being revived by a second laboratory report—over 8 months later— saying that the meat found in Akhlaq’s house was beef. Maha-panchayats are being activated again around this issue. In the current scenario some TV channels and newspapers are taking up baseless propaganda, adding to the communal poison being spread in the state. A Yale University study shows that after the acts of communal violence, BJP usually gains electorally. Kairana is yet another effort to stoke the fires, but given the media exposure it remains to be seen whether Hukum Singh and the BJP will retract from the ‘exodus’ propaganda, or take it further.